Trolley able to move fore-aft, winches synced to tilt AUV at 45deg angle to clear the ship’s hull, then tilt back to horizontal for deployment. System designed to ABS Rules for Underwater Vehicles, Systems, and Hyperbaric Facilities. 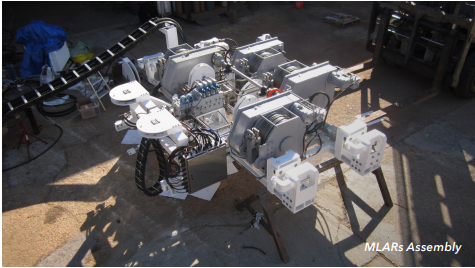 SIT combined their hydraulic and electrical experience to design a system of 6 custom winches: 4 winches synchronized in pairs mechanically with an axle as well as with sensors electronically; 1 winch at deck level to attach to AUV umbilical data cable; and 1 rescue winch in case of power failure. Custom gearbox design was necessary to meet load requirements and high torque rating while keeping the winches within the tight space constraints to fit within the hull of the ship. Working with the specific criteria of the custom AUV cage and existing ship structure, SIT fabricated and assembled a cursor assembly guide to ensure the AUV remained in place while lowering through the moon pool doors. To control the entire system, SIT designed a control panel built to place on the ship deck with a joystick and touchscreen interface. When all was said and done, SIT met the requirements necessary to complete the Custom MLARS project. Interested in other MLARS or large moveable structure developments? Give us a call! Supreme Integrated Technology, Inc., a subsidiary of Employee Owned Holdings, Inc., is headquartered in Harahan, Louisiana, and is a 100% employee owned company. For other information about SIT and our family of employee owned companies, please visit www.supremeintegratedtechnology.com.